Zentangle PRIMER Vol 1 is the second book from the founders of Zentangle®, Rick Roberts and Maria Thomas, released on March 6th, 2016. It’s been two years in the making and the attention to detail shows. I just received my copy! As you might expect, it’s so full of beautiful eye candy. And this time it’s all in Zentangle black and white (except for the color endpapers), which to me IS Zentangle. Our desire in creating this tome was that your copy will eventually have tattered corners, well-worn pages, and hand-drawn notes in its margins. A book that has been loved and used. It will become your go-to book of all things Zentangle. This book is an ‘old-world’ instructional that is simple in its delivery but with enough information to gently guide the novice, or enlighten the master. Whoever reads this, will find what they seek. Hidden in the margins and borders and exemplars are inspirations. Each time you leaf through its folios, you will find something new to spark your creativity. Each time you study it, you may find yourself going just a bit beyond what you previously thought possible. Right away I want to point out — because I’ve already been asked — that the tangles included in the book are established ones that are publicly available and are here on TanglePatterns.com. You can find all of these from the links on this page, or by using the pink alphabetical tangle index on any page. However, this book is not about the tangles. The tangles are an assist and an enhancement to teaching about everything Zentangle and taking your practice to new levels of creativity. Notes – “A behind-the-scenes conversation about some of the images and stories in this book.” Fascinating!! Includes a new Zentangle-original tangle Ravel that we’ve yet to see steps for. And one or two more “as yet unnamed” tangles inspired by museum visits. And in case anyone besides me notes it, tortillion is also spelled tortillon. I use the first version, R&M use the second and provide both in the Glossary. I think it’s wonderful to have all of this information about Zentangle available publicly, directly from the source. I’ve noticed over time many tanglers (and even some published books about Zentangle) have strayed from the fundamental concepts or perhaps they just misunderstood them in the first place. Zentangle PRIMER Vol 1 should set the record straight so everyone, CZTs and non-CZTs alike, are communicating in the same language and a full understanding of the same basic Zentangle concepts. And learning (or re-learning) to develop their Zentangle Practice armed with a delicious volume of beautiful images and encouraging words to take your practice to new levels of creativity. Somehow I can’t imagine myself writing notes in the margins of this beautiful book, as intended by Rick and Maria. But you never know. Whether you’re a seasoned tangler or a total novice new to the concept, you will love and treasure this book of the basics of Zentangle and much, much more. Got your copy? Please add your comments below! I’ve just received my copy of the brand new “Zentangle PRIMER Vol 1”, and here’s a first blush look at its contents. Thanks, Linda. It looks like a great book. Mine’s supposed to be arriving tomorrow. I can’t wait! I got mine yesterday. 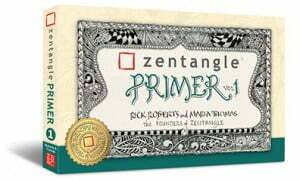 It, Zentangle PRIMER Vol 1, is awesome, well written, well explanation, well designed, and everything. When I got it yesterday afternoon, I could not wait to read and I read it through all last night. EXCELLENT BOOK!! Im looking forward to Vol 2 and more. Wow, this is a wonderful book. Beautifully written by Rick and Maria. The new Reticula and Fragments section is stunning and is going to be an exciting addition to the Zentangle Art Form. The Notes section is so fun. Love the behind the scenes comments about the images in the book. It goes without saying, that the Bijou interjections and sidebars are refreshing and delightful. I’ll be studying this book for a long, long time. It is a true Gem. I hope every serious Tangler gets a copy of this book. I love my book! I love that the cover is made from same green fabric as the box kit! As I love how meaty this book is- chock full of words and is good for novice and expert alike. Beautiful book! Loaded with inspiration and valuable advice for beginners thru advanced Zentanglers. What an absolute joy of a book. I can’t give enough praise for the love and thoughtfulness that went into the creation of what is now my favorite of all the Zentangle books that I have on my shelves (and I have a lot!). This book gently guides you from the basics of what we may have forgotten or drifted from right into new exciting territory. What a wonderful gift to the Zentangle community. Thank you again to Maria and Rick! I received my new Zentangle book just before the weekend, so nothing much got done, because once I started reading it, there was no stopping. Absolutely joyful! Everybody, including you Linda, have summed it up so well, I can’t think of anything to add. I knew it would be good when I ordered it, but it surpasses my expectations enormously! Stop reading all these reviews, just GET IT! Absolutely the best Zentangle Book yet! As an accomplished artist I used to think I did not need instruction on this art form. How wrong I was! My tangling improved by leaps and bounds after reading this book. If you think you have Zentangle down then you need this book more than ever! I have been working my way through the Zentangle Primer and enjoying each exercise. Even though I have been tangling over a year with the help of your website and quite a few books, this is the best. I love having it on my shelf and using it for daily practice..it has already improved my work. Got mine at CZT #22. Thanks Rick and Maria. I am enjoying it and looking forward to where this journey may take me. Have my first class coming up soon even if just a one on one.